Adapting to the IIoT can help you stop hovering over machines & waiting for a problem to occur. 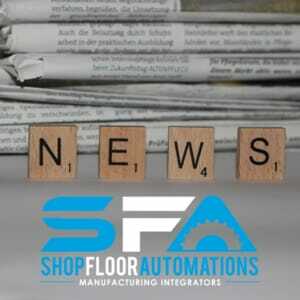 Shop Floor Automations can easily help implement this new technology. Embracing manufacturing shop floor automation and the Industrial internet of things (IIoT) will help the American manufacturing sector as it tries to keep pace with the millions of manufacturing jobs that need filling. Implementing automation tactics such as machine monitoring, DNC software, job scheduling, CMMS, and more, does not intend to replace people who could do these jobs. But what exactly is the IIoT? “Although there is no exact definition for what this phrase means, it undoubtedly refers to the strategy of linking machine tools, and other shop floor equipment, to a web-enabled network that makes manufacturing increasingly data-driven,” says Mark Albert of Modern Machine Shop in their January 2017 issue. The power of the IIoT is more than a fad nowadays; it’s revolutionizing maintenance operators. Nearly every asset in a manufacturing environment has the capability to provide critical information. This capability can come directly from the machine using handheld devices, such as pressure calibrators or multimeters, or machine-mounted sensors to collect and feed critical asset data to a single system of record. Cloud-based software, such as Scytec DataXchange or Predator MDC, can easily monitor CNC machines that already have the necessary interfaces to connect to a network and the internet. For legacy machines that do not have a readily available Ethernet port, SFA has found easy-to-deploy solutions to establish Cloud connectivity. Want a quick laugh? Check out our machine monitoring themed Shop Floor Man comic strip. Machine monitoring is definitely a big part of the IIoT and we would love to tell you more about it, so contact us anytime! Quick announcement: Our friends at Workshops for Warriors are holding an inaugural gala aboard the USS Midway here in San Diego on April 20th, 2017. The event will honor military veterans and raise money for their cause of gaining manufacturing industry certifications for veterans. If you would like to attend or donate, call (619) 550-1620 to see how you can help contribute! For more information on any of the topics above, call (877) 611-5825 or fill out an inquiry form. Read the original newsletter.